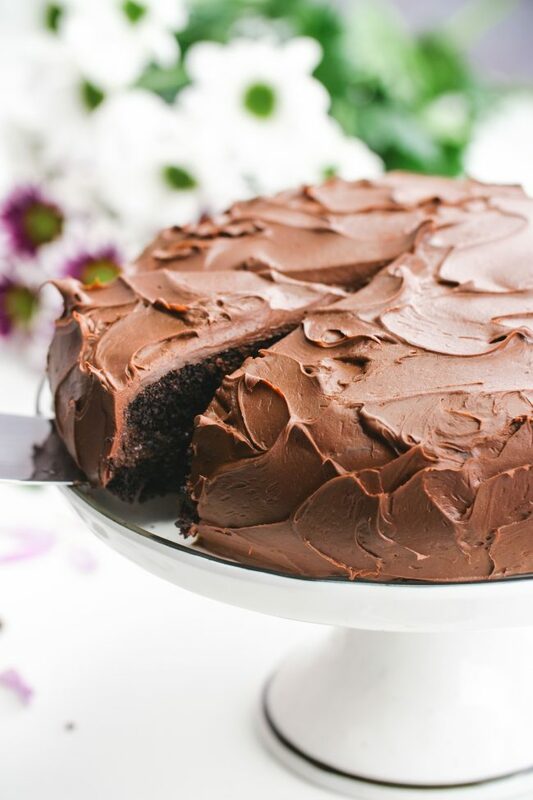 This vegan chocolate cake is fudgy, super moist, ultra chocolaty and is topped off with an easy whipped chocolate ganache frosting! Can be made gluten-free, whole wheat or with all-purpose flour. Today my little boy turned one year old! In celebration, I’m posting this vegan chocolate cake. If you’re here just for the cake, scroll down past the baby picture to where it says All About The Cake. If you’re one of my followers who has been wondering what’s been up with the serious lack of recipes the last year, keep on reading! I’ve reposted a lot of old recipes this year. I’ve mentioned this in a bunch of other posts, but when I’m working on a new recipe, I usually make it 10+ times before I think it’s perfect. And I don’t want to post something unless I think it’s absolutely perfect. Up until Björn was about 9 months old and became more mobile, he was what you would describe as a very fussy baby. He was rarely happy and everything was a challenge. Things are so much better now but I’m still far from having time to develop totally new recipes (starting in February, that’ll change!). 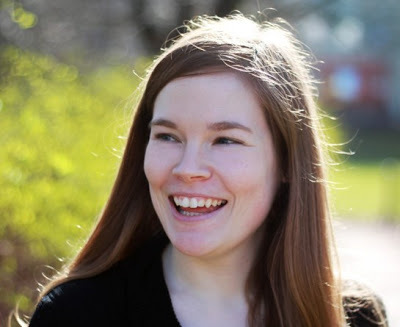 When Björn was a few months old, he started to get eczema. So we did some allergy testing and the number of foods he wasn’t supposed to eat was really hard to deal with. Same with me. Other than one brand of jam, there’s nothing we can buy premade from the store. I make everything from scratch. It wouldn’t be that bad if I could work in the kitchen when he’s awake. But if I’m in the kitchen, he stands at my leg, crying and tries to pull down my pajama pants. So yeah. I don’t get anything done with him around! But I’m not complaining. We had a really tough start and I’m thrilled that things are getting better and better. Warning! Some people might consider the next part unappetizing in a post about a dessert recipe. Scroll past the baby picture if you just want cake. So – on to the cause of our difficult beginning. I had undiagnosed placenta accreta, which is when the placenta grows too deeply into the uterine wall and can’t detach as it is supposed to after childbirth. With placenta accreta, part or all of the placenta remains attached. It can even grow onto other organs. It’s usually diagnosed at some point during the pregnancy and from what I understand, you would then have a planned C-section at 34-36 weeks, with a team of doctors prepared for the hemorrhage that most patients have, often followed by a hysterectomy. Pretty much the entire staff came running in the room while they tried scraping it out. I could feel it all. It was so much worse than the birth! It was chaos. But that didn’t work so they put me under and then I had a 3-hour surgery. I lost a lot of blood but had a transfusion, which helped a ton. The images I had from the part where I was still awake were hard to deal with for a long time. But it’s easier to handle now. I’m really lucky and thankful to be celebrating Björn’s birthday with him today! I decided to make myself this vegan chocolate cake in celebration. :D Mr. Texanerin got one piece. Björn didn’t get any. He won’t be partaking in a cake like this for a while if I can help it. Today we had a little birthday party for Björn and we ate this Healthy Vanilla Chocolate Cake from Feasting on Fruit. She has a ton of vegan, date-sweetened + oat flour based recipes and I’ve made and loved so many of them. 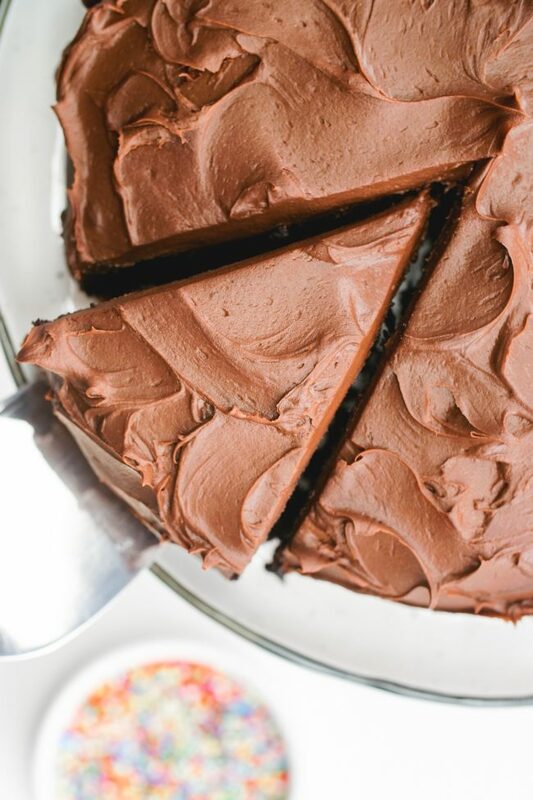 This vegan chocolate cake is seriously the most delicious chocolate cake ever. I think I even prefer it over this whole wheat chocolate cake recipe. And amazingly, nobody can tell that this cake is vegan or gluten-free! If you prefer, you can use whole wheat flour or even all-purpose flour. White whole white or whole spelt also work. I’ve also tried this cake with buckwheat flour and found it pretty strange. It tasted floral somehow. One thing I love about this cake is that it doesn’t require any usual ingredients. You don’t even need chia or flax seeds to make egg replacements. If you’re vegan or egg-free, you most likely already have these at home. But for someone who is looking for a dessert recipe to make their vegan friend, this is a great option! And the frosting is super easy and not too sweet like buttercream usually is. I used a vegan chocolate ganache that’s just chopped chocolate and coconut cream. All you do is melt it together, chill and then beat until fluffy. Then you have yourself some whipped ganache frosting! Oh, and there’s salt in there. 1/4 teaspoon salt. I haven’t really seen that in many ganache recipes but I think a bit of salt makes it even more delicious! Feel free to omit that or only use 1/8 teaspoon. 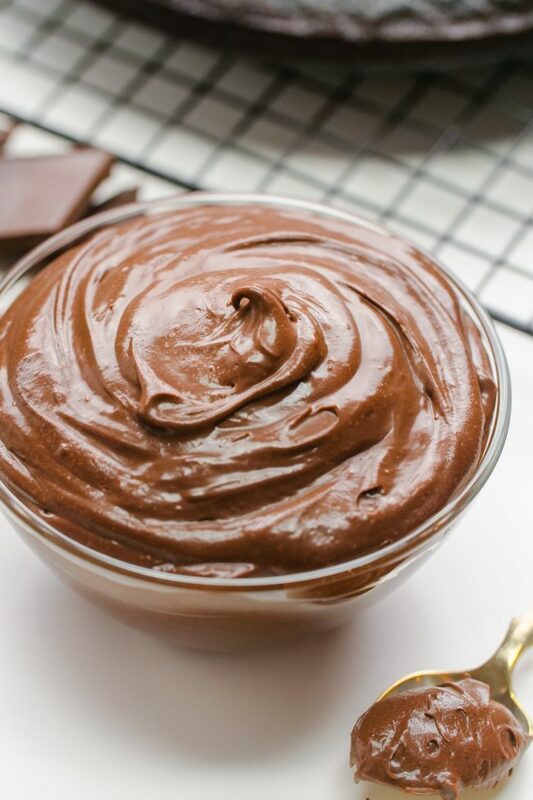 This vegan chocolate fudge frosting would be another delicious option if the whipped ganache frosting doesn’t sound your speed. If you’ve got any substitution questions, check out the below section! Just one last note. This recipe uses 1 1/2 cups of water but if you have milk that needs using up, you can definitely use that in place of the water. I wouldn’t say that the cake tastes any different with it so I wouldn’t buy it just for this cake. The batter will be super runny. Don’t be alarmed! It’s normal. Questions about this vegan chocolate cake? Can I use another oil other than olive? You can use canola oil, vegetable oil, grapeseed oil, etc. Anything neutral tasting. Coconut oil also works. Can I use butter? I bet you could use butter in this cake for a non-vegan version but it wouldn’t be as moist (butter is 80-82% fat and oil is 100% fat). Same goes for vegan butter. Does the gluten-free version taste gluten-free? This vegan chocolate cake honestly tastes like it was made with all-purpose flour. At least with the gluten-free flour mix I used and after it’s cooled a bit. Can I use almond / coconut / other flours? Unfortunately not. If you want to use other flours like rice flour, buckwheat, whatever – you’ll have to experiment. There’s no direct sub for gluten-free flour mixes. Can I use a liquid sweetener? Unfortunately not without experimenting! You could use a little honey or maple syrup for part of the sugar, but you’d have to reduce the liquid in the cake. Can I reduce the sugar? You could probably get away with reducing it by 1/3 cup. Reducing sugar also reduces moist-ness so unless you want a dry cake, don’t go overboard and reduce it to 1/2 cup or some small amount. Does the frosting pipe well? I haven’t tried it but it’s pretty firm. It should work but I can’t guarantee it. Here’s a pan conversion chart that should help. Looks like a 9″x13″ would work, though I haven’t tried it. Can I make this recipe into cupcakes? Yes! This recipe will yield 16 cupcakes. Fill the liners slightly more than half-way full and bake for 16-18. The frosting yields just under 2 cups so that’d be enough for 2 tablespoons of frosting per cupcake. Can I freeze the layers / frosted cake? Freezing the layers would definitely work. Freezing frosted layers, though? I think it’d work but I’m not 100% sure. 70 comments on “Vegan Chocolate Cake (gluten-free, whole wheat, all-purpose flour options)” — Add one! What a little doll! And the cake looks pretty good too! Roby Mitchell, MD, a Texan doctor, has done a ton of work on treating eczema, an autoimmune condition often exacerbated by a leaky gut and vaccines. He has a Facebook page and does long distance consults. Hi Crystal! I’m so sorry for just now seeing your nice comment. Thanks for the tip! I’ll definitely check him out. How cool that he does long distance consults. Thanks again! Glad you are doing well and healthy again, congrats on a beautiful baby boy! 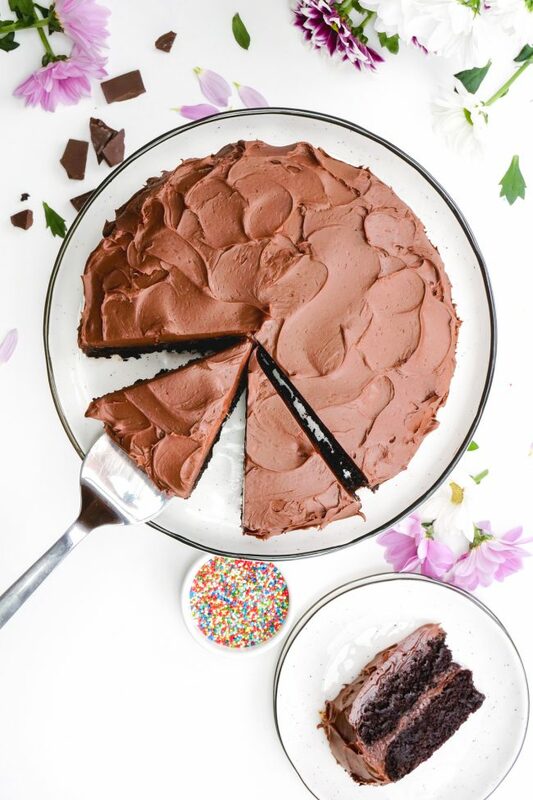 I absolutely love your recipes, this chocolate cake is a new favourite for special occasions! Thank you!! Thank you so much! And I’m super glad to hear that you love the cake and the other recipes. That’s always so nice to hear! Thank you again and sorry for my very slow reply. 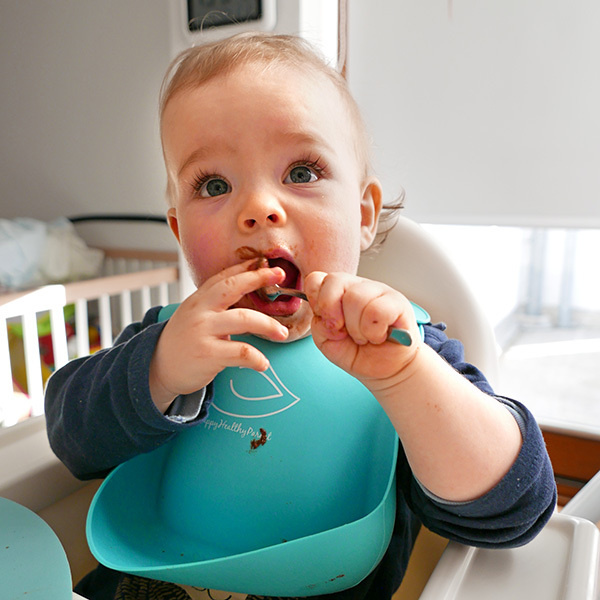 Beautiful cake, beautiful boy and great recipe! Thanks for sharing! This is the absolutely best chocolate cake I’ve every made. I’m 75 yrs. young and a very experienced baker. I served this cake for Christmas Eve dessert. It was a tremendous hit. I’m also vegan. The big question is: When adding the dry ingredients to the liquid I got sooo many lumps (which I worked out with my fingers) so I didn’t stir it so much. But I’m wondering if I slowly added the liquid ingredients to the dry if it would mix easier. Also I think I would sieve the dry ingredients to prevent lumps mostly from the cocoa powder. This is definitely my keeper all time cake; but about the lumps. Any suggestions? I’m so glad that it was a hit at Christmas Eve! I’ve never actually tried adding the wet to the dry so I’m not sure if it’d really help. My dry mix was totally lump-free so I’m not sure sieving would help, either. Not very helpful, am I? ;) I would recommend adding the dry mix to the wet, a little at a time, and see if that helps. Or try it the other way around! It can’t hurt. And I’m curious. :) I’d love to hear how it comes out! Thanks for your comment. Would like to try it for my husband birthday. Can I use any gluten free flour or does it have to be Bob’s red Mill ? Hi! I’m sorry for just now seeing your question. Hopefully you found the answer in the substitution section of the post. 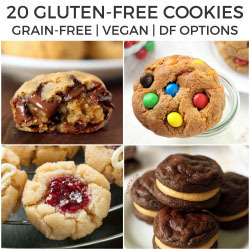 :) Can I use a different gluten-free flour mix? I used this (Bob’s Red Mill) 1-to-1 gluten-free baking flour. If you have another brand that works as a sub for all-purpose flour, then you could probably use it here. I can’t say the texture would be as perfect as with the flour mix I used, though. I made this cake for Christmas and I couldn’t believe how wonderful and delicious it turned out! Definitely a crowd pleaser. Thanks for the recipe! I’m so sorry for just now seeing your comment! I didn’t realize I wouldn’t have internet at my in-laws over the holidays. :/ I’m happy to hear that you enjoyed the cake! I also made it over Christmas because it’s just so good. :D Thanks for your comment and sorry again. Ok, this cake has great flavor but horrible consistency. I made it twice in one night bc one cake just totally crumbled. Second batch the same. How the heck do you get it to not completely fall apart? I’ve gotten a lot of reviews on this cake and nobody has mentioned it crumbling. It’s actually super, super moist! So there must be an issue with your ingredients. What kind of flour are you using and are you making any changes or subs at all? Hmm. Which flour did you use? It’s so moist that it’s quite delicate but it shouldn’t have fallen completely apart! Made this yesterday for a group of non-vegans and they LOVED it! They couldn’t believe it was vegan. It was so moist and the ganache was amazing. Yay! I’m so happy that everyone loved it, including the non-vegans. :) Thanks for your comment! 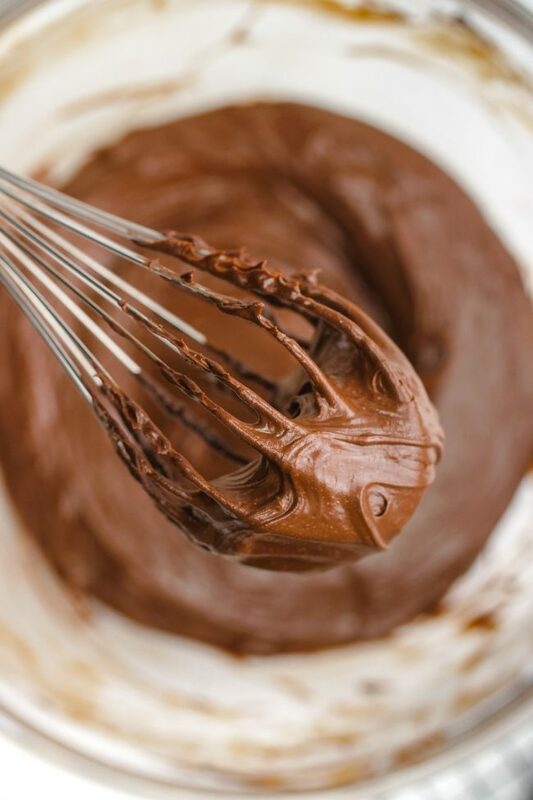 You can make the ganache without a mixer but it may be difficult to whip it without a mixer. It’s delicious when it’s unwhipped! It’s like a regular ganache and not a whipped ganache. So happy to read this! This I’ll do then!! :))) Thank you!!! Silly question I’m making a chocolate and vanilla cake, will this recipe work out ok for the vanilla if I just omit the cocoa powder? Hi! Unfortunately not. :( The whole recipe would have to be reworked if you omit the cocoa. Definitely find a vanilla cake recipe! Thank you for the quick reply, saved me from making a big baking mess! I did bake the chocolate cake last night. Great recipe thank you!! And it tasted like a good vanilla cake? I just can’t imagine how that’d work! Was it super sweet? Because when you add cocoa powder, a lot of sugar is needed. Without the cocoa powder, you wouldn’t need so much sugar. 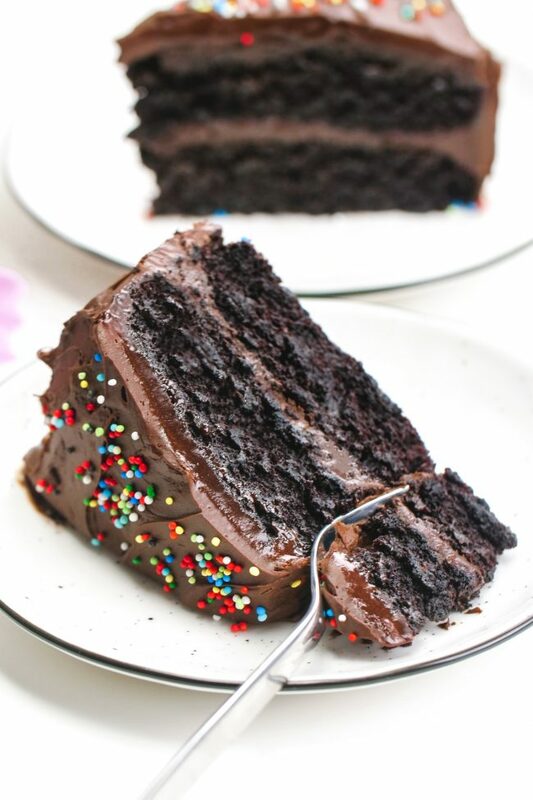 This looks like the most perfect chocolate cake ever! I can’t wait to try it! Very glad to hear everything turned out okay for the both of you.I hope things only continue to get easier and better for you guys!! Awesome recipies! Hi! I want to say the cake came out amazing! I will definitely be making it again. Do you ever have a hard time getting them out of the pans? I didn’t use parchment, just avocado oil on the bottom and sides and they were not so easy to come out. I managed and fixed it with the amazing frosting! Keep up the great work with your recipes! Hi Julie! I’m so very sorry for just now seeing your comment. It landed in spam for some weird reason! I’m so happy that you enjoyed the cake. :) I haven’t had any issues with it coming out, but I always use parchment on the bottom and coconut oil on the sides. Thanks for your nice comment and sorry again for just now seeing it! Do I use the whole can including the coconut water or just the firm coconut cream part in the ganache? You just use 1 cup (240ml) of the milk. So mix the cream and water together and use 1 cup of that. I’d love to hear how it comes out! Thank you for another beautiful recipe, Erin. We so appreciate you!! Hang in there. You’ve been through such a rough experience, poor girl, but wonderful times are right around the corner. A fussy baby is so hard, but they end up being your best friend. Trust me on this…and now my fussy son’s wife is giving me a grand daughter this spring. Thank you once again. Your hard work has been so valuable to me. Your recipes allow me to bake delicious treats for my gluten-free Texan daughter-in-law. Oh Erin I was wondering how you were doing this past year adjusting to motherhood! What a scary beginning, but now look at that healthy happy little boy with lashes that just won’t quit! I’m so glad you are both doing better! Just remember, recipes will always be here but your sweet baby will only be little for *such* a little while. My son was super difficult too, and I think if I would’ve been blogging when he was born I would’ve quit! LOL! Glad to have you back doing what you can! Aww, thank you! What a nice comment. :) And yes – that’s the attitude I’m trying to have. I can continue working when he’s a little older! I’m not going to let myself get worked up over not being able to work for more than about 2 hours a week anymore. I hope your son is less difficult now. :D Thanks again for your nice comment! Can I use only coconut sugar? Or both are required? Thanks a lot! Aww, yay! I’m really so happy that it was a big hit for you. :) And I’m with you. I’ll always be on the lookout for an excuse to make this. :D Thanks a ton for your feedback (and your IG post!). I don’t usually bake cakes since it’s just the two of us but with the holidays coming up I might have to deal with eating chocolate cake for breakfast! Congrats on the birthday and thanks for sharing your story and hope it only gets better from here. So the chocolate in the ganache is dairy free chocolate?! Yup! Most semi-sweet chocolate is vegan and dairy-free. At least where I live. :) But I’ve also linked to a brand in the recipe if that helps. 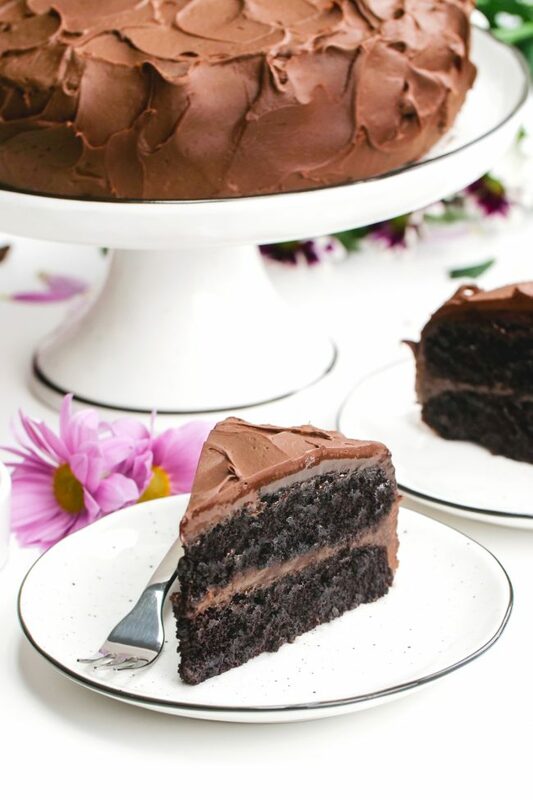 This chocolate cake looks absolutely delicious! I can’t wait to give it a try! I absolutely love all your vegan recipes. Your baby is so beautiful. The only thing I change is instead of coconut sugar I use “Lakanto golden monk fruit” it is expensive but it has such a delish!! taste. Thanks, Terri! And good to know about Lakanto. Do you have good luck with using it as a 1-to-1 sub? I have a bag of it but haven’t had much success with it. Thanks for your comment and sorry for just now seeing it! Oh, what a cutie he is. How can he be a year old already?? WOW!! My goodness I have never heard of the condition you had. What in the world did they do when they discovered it? That seems a bit scary. No wonder you have been taking time off. You needed it. This cake looks really moist. This cake looks so delicious and festive! I love it that it’s vegan! This looks fantastic! I love gf/df chocolate cake. You never know it is gf and df and people look at ya kind of funny when you tell them it is and they think it tastes awesome too! Happy Birthday to your little one. I am sorry to hear about all of your struggles but it does get better as they get older. Happy birthday! And wow mama you’re awesome!!!! Since I’m a birth story nerd/junkie, gotta ask- did you have to have a hysterectomy after all? What a treasure Björn must be! Thank you! And haha… a birth story nerd. :D I wrote a little bit about it in one of the comments above yours. They did everything they could to not do a hysterectomy. The doctor said that’s what’s normally done but just that surgery alone, done under the most planned circumstances, comes with a host of problems. So it’s good that it wasn’t done on top of everything else! The experiences I’ve read from other people with accreta have been terrifying. Bed rest in the hospital for months, babies in the NICU for 2 months, several blood transfusions during the surgery, awful side effects from all the transfusions, hemorrhaging at home a week after the birth, heart failure, organ damage, organ repair surgery, side effects from those surgeries and on and on. I had a really hard time and was very weak for a long time but I’m really lucky and so thankful that it ended so well! Just wow girl, so glad you made it through and are beginning to see the light at the end of the tunnel. I have 7 kiddos, and we had some stories to tell, but yours is just WOW that you and sweet boy made it alive and well!. Love that sweet little face! Thank you, thank you! And wow. Seven! You are brave. :) Thanks again for your nice comment! Glad you’re back Erin, we missed you!! Sorry you had such a difficult time :(. Björn is such a cutie!! Awww, happy birthday to your baby boy! He looks so sweet. I’m so sorry you’ve had a difficult beginning – as much as I love all your recipes, I totally understand why you’ve taken some much-needed time off from your blog. I hope that things keep improving and getting smoother for both of you!